On March 7, 2012, Apple fans everywhere were glued to their computer screens awaiting the news from Apple’s iPad Keynote event. At this event Apple’s CEO, Tim Cook, outlined the dazzling features and other information regarding Apple’s newest tablet. 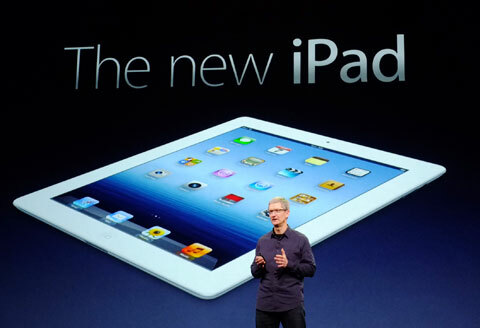 Before the announcement, the internet was swirling with rumors about the follow-up to the iPad 2. Weeks before the Keynote, people began speculating about what the tablet would be called. Some of the more popular names being rumored were “iPad 3,” and “iPad HD.” We we’re surprised to learn that Apple will simply call it “the new iPad.” The name is reminiscent of Coca Cola’s “New Coke” campaign in the 80’s, but we’re confident that the new iPad will fare much better. So what are some of the features/specs of The New iPad? When does QuiBids plan on offering it? How will the new iPad impact the future of technology? To help us get better insight into these questions, we’ve brought in our own electronic/gadget specialist, Kevin Elliott, who also happens to be the Category Manager of Electronics here at QuiBids. The following is taken from an exchange between myself (Blake Brown) and Mr. Kevin Elliott after the Keynote commenced. Me: What are some of the new iPad’s features/specs that stood out to you? Kevin: Apple quadrupled the # of pixels in the new iPad compared to the iPad 2. This makes the pixels indistinguishable to the human eye, and results in a super sharp and crisp HD screen. A new A5x chip doubles graphics performance, which especially comes in handy during gaming. A new 5MP camera (iPad 2=.7MP) rounds out the major changes. Data plan ready models now have 4G capability. Me: What are your overall opinions or impressions from Apple’s iPad Keynote? Kevin: I think the “new Ipad” will do very well. It comes in numerous configurations in colors that fit a wide variety of potential customers. Apple continues to build innovative and ultimately extremely usable product that consumers want. Apple sold a staggering 15.4 million iPad 2’s in Q4 of 2011. It was a smart move to keep the iPad 2 in the lineup at a reduced price to give the Kindle Fire and other tablets a little pricing competition. Me: Any speculation on the new iPad’s impact on the future of technology? Kevin: Apple revolutionized the industry with the iPod, then the iPhone, then the iPad. They are on the forefront of the tech industry and I wouldn’t be surprised if we saw an entirely new gadget from them next year, that piqued customer interest and demand all over again. Once the new iPad is offered on QuiBids (don’t worry, it is coming to QuiBids soon), the old iPad (iPad Mini) will still be available to bid. But at a lower retail cost and with smaller demand, it should be much easier to win. Will you be bidding on the new iPad? We definitely recommend inexperienced bidders to be careful, because competition for this tablet is sure to be fierce. If you do intend on bidding on the new iPad, now’s the time to prepare your QuiBids Strategy,and maybe even give yourself a QuiBids 101 refresher too. You can check out a full video of Apple’s iPad Keynote here. You could be in the next QuiBids commercial!